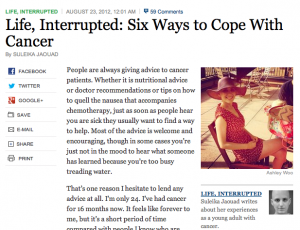 People are always giving advice to cancer patients. Whether it is nutritional advice or doctor recommendations or tips on how to quell the nausea that accompanies chemotherapy, just as soon as people hear you are sick they usually want to find a way to help. Most of the advice is welcome and encouraging, though in some cases you’re just not in the mood to hear what someone has learned because you’re too busy treading water. That’s one reason I hesitate to lend any advice at all. I’m only 24. I’ve had cancer for 16 months now. It feels like forever to me, but it’s a short period of time compared with people I know who are going on 5 or 7 or 10 years living with cancer. But I’ve received some heartfelt advice and solidarity along the way from fellow cancer patients, doctors, friends – even from strangers – and it has meant a lot to me. It’s been 16 months since my diagnosis and four months since my bone marrow transplant, and now I want to share what I’ve learned along the way.